Alas, how could I have forgotten the fourth font of anti-trans foment? 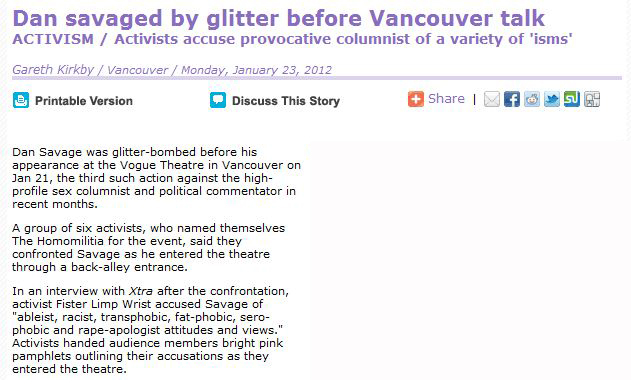 Now, to be fair to Towleroad, the title of its piece accurately reflects that trans concerns were not the only thing that the alleged glitterbombers were allegedly concerned about at the alleged glitterbombing of Dan Savage that allegedly occured in Vancouver this week. He’s part of a broader [group] of gay, white, cis-gendered, able-bodied gay men focused on gay-marriage priorities. We want to say those priorities are messed up. I don’t see anyone criticizing Savage merely for supporting marriage equality. You don’t see me criticizing anyone for merely supporting marriage equality. What you do see – whether or not Towleroad saw it or wanted to see it is a different matter – in Xtra is someone expliclty only expressing dismay over gay marriage prioritization. because such an identification is not there. Are any of them trans? I have no idea – but if, as it certainly appears to be, the Xtra item is the only source that Bil Browning, Joe Jervis, The John and Andy Towle are utilizing to pontificate about the alleged Vancouver glitterbombing, then neither Bil Browning nor Joe Jervis nor The John nor Andy Towle know either. But why let (a lack of) facts get in the way of an opportunity to whip up more anti-trans hatred, eh? Can we glitter bomb the trans activists, please? They are really getting on my nerves. These glitter-bombing idiots are just working against themselves and the cause. I don’t get why they are g-bombing Savage for SUPPORTING marriage equality? Im getting tired of “Trans Activists”, you are either 100% with them or 100% against them and they seem to have no middle ground. They are apparently not interested in working together, and neither am I really. Marriage is important to a lot of Gay and Lesbian and Bisexual couples, so that is our focus. We have made a grave mistake in this alphabet soup business. LGB is more than enough to handle. T and Q can handle their own business. I think it’s a bit selfish of trans activists to be angry about him supporting marriage equality. I don’t know their language or their problems. It is time to let them take the reigns on their own issues. T can take care of themselves. Their issues are incongruous and their behavior is demonstrably against what we are attempting to fight for. So trans activists, are you happy now that you’ve alienated a big % of your natural allies? Professional ‘victims’ attacking an ally with their made-up BS is seriously as destructive as our enemies at FRC AFA etc. GET A CLUE ‘activists’. Want to protest someone? Pick a target that ACTUALLY wants you dead, stupid! So, this trans fringe that opposes marriage equality reminds me of women who oppose rights for women, cuz women are so beaten down. I think those “activist” are crazy and act like a sect, just conviced of their cause just because is sounds logical to them and them only without listening no one else. Sadly their attitued will taint those trans people who don’t think like them, the crazy mini group. 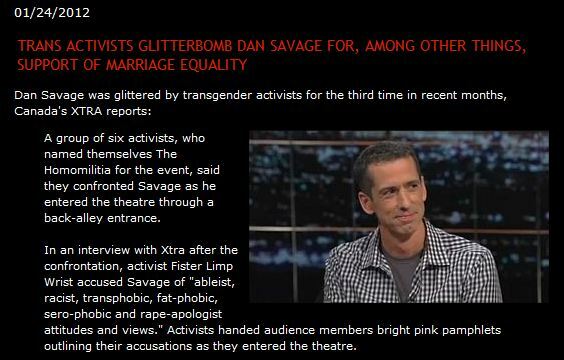 These activists need to back up and look at this irrational pursuit of Dan Savage–the facts just don’t back up their claim…. Why indeed should Andy Towle let facts – or the lack thereof – get in the way of an opportunity to whip up more anti-trans hatred among the obnoxious, history-deficient, over-privileged subset of gays and lesbians who already hate trans people and need a reason to feel justified in doing so? This entry was posted on Thursday, January 26th, 2012 at 5:30 am and is filed under History, John Aravosis, WRPGMs. You can follow any responses to this entry through the RSS 2.0 feed. You can leave a response, or trackback from your own site. You ,issed the comment from Endo, with his oh-so-gentlemanly “Eff those tr### right in their fake gashes.” Because the folks at Towleroad are uniters, not dividers. How DARE something something ALLY?! ?